Believe it or not, this was taken early in the celebrations. 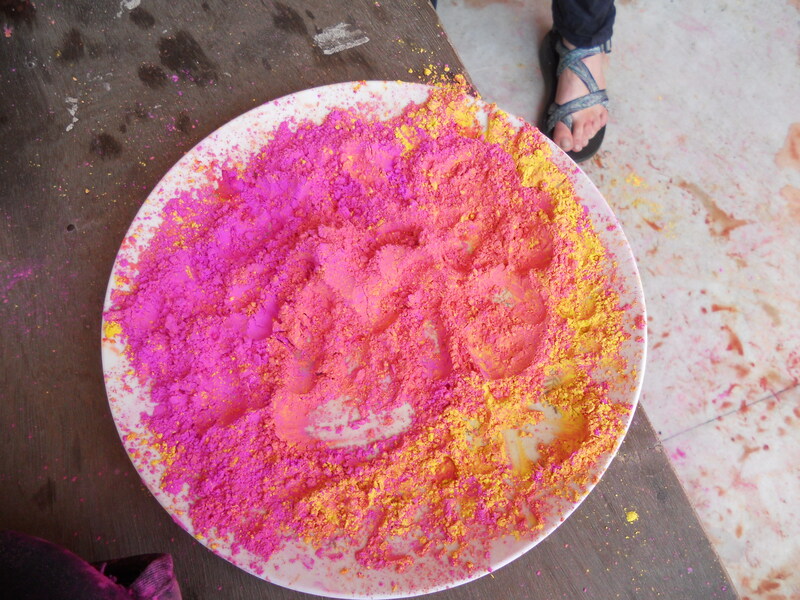 Happy Holi!!! 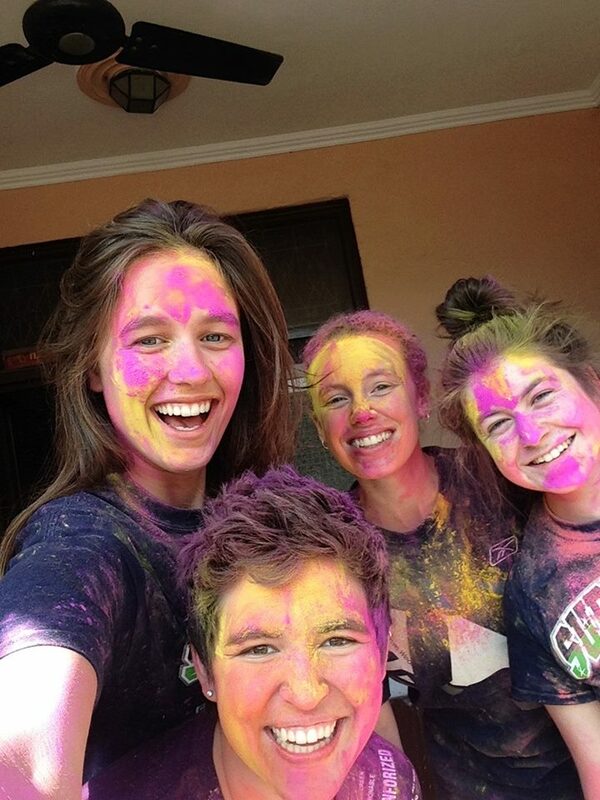 Today was the day I have looked forward to since I made the decision to come to India. When I started to tell people of my plans to come here and they asked why I would want to I always answered with “Well, I’ll be there for Holi.” Meaning I will be in India for the best holiday in the world. Let me tell you it did not disappoint in the least bit. 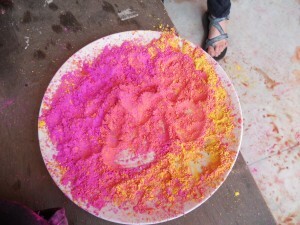 My host family does not play Holi because my parents are older and my sister is allergic to the powder that is thrown. Luckily there is one other host family with students in my neighborhood and they invited us over to play with them. Cassie and I were told to walk over no later than 10am or else the streets would be too crowded and unsafe. The 5 minute walk to our friend’s house was much more than we bargained for. Nobody is safe on Holi. I mean nobody. In just the short walk we were hit with multiple water balloons and covered in colors. Due to the utter chaos we got a bit turned around. The guys that covered Cassie and I in colors ended up helping us finding our friends apartment (more about them later). When we arrived at our friend’s house we continued to throw colors at each other until we were all covered from head to toe. Now one thing I did not realize about Holi until getting here is that they also celebrate with water (balloons, guns, buckets etc.) and sometimes even eggs. The apartment we were at was on the second floor which is prime location for throwing water balloons at people passing by. Most people walking around or on motorcycles are loaded with their own balloons to throw back. Basically you have a huge water balloon fight with the whole street. It is great fun….until you realize that the door to your balcony is unlocked. Yes. A group of guys that we threw balloons at ran up the stairs and covered us in colors. My first instinct to seeing them run up was to zip my backpack shut and face it to the wall so that nothing could be taken from it (my dad would be so proud). My friends’ host mom yelled at them and locked the door behind them. It was hilariously terrifying. Later in the morning the guy who helped Cassie and I find the apartment stopped by with about 50 of his friends. They all rode up in motorcycles screaming “HAPPY HOLI” and played drums while we threw water down. It was so incredible. Soon after, we started to clean up the balcony which was full of colored water, balloons, and eggs. Cassie and I still had to get back to our house but we elected to get a bike rickshaw this time. On the ride back we were hit with more colors and water balloons. I am so happy that I was able to celebrate this great holiday and cross something off of my bucket list!